Written by Dustin Jermalowicz When it comes to betting firms throughout the world, one of the biggest names has to be Victor Chandler. The group was founded in 1946 and has grown to become a whale in the gambling industry, generating more than £1 billion in turnover annually. In 2011 Victor Chandler International re-branded itself to the moniker BetVictor. Although its name has changed throughout the years, the group has always maintained a steady and innovative betting product. This extends to the group’s online and mobile betting offerings. For the sake of this review, I ended up taking a look at the group’s mobile Android offering. Is it as solid as BetVictor’s awesome PC offering? Read on to find out. I opted for my workhorse mobile phone in order to complete this review of Bet Victor. My device is the HTC Butterfly, which contains a 5 inch touch screen, 2 Gigs of RAM, and a QuadCore Snapdragon processor. The device is legit, and handles almost everything that I can throw at it. I felt it was perfect for the demand that a high quality site like BetVictor would be sure to throw at me. Visiting BetVictor’s site gave me an instant immersion into the mobile platform that the group provides. The look is clean, and fit my phone perfectly both in portrait and landscape mode. This certainly is one of the finest looking mobile sites that I have ever seen, and I can’t help but think that other casinos would be wise to emulate what BetVictor does. Registering an account at BetVictor on my Android is among the easiest experiences that I have had at a mobile casino. The registration button slides out from the side, and I was able to easily enter my information. After the initial screen, I had to input more information and finally got myself all set. I would say the registration process took a minute and a half, tops. Putting money into BetVictor is as easy as any Android betting site I have seen, and the options available are incredible. You can deposit money into BetVictor through Visa, MasterCard, PayPal, Skrill, Neteller, Bank Draft, Check, Solo, UKash, Western Union, Maestro, Delta, PaySafeCard, and Solo. I had no problems getting my money into BetVictor through my Android, as my Visa card was easily accepted and I was able to bet on some football matches and play some casino games. £25 Free Bet: When you register an account, BetVictor will match the value of your first bet with a free bet up to £25. This is a pretty nice bonus that is good for getting started. Football Specials: there were no less than four different kinds of football promotions to take advantage of, and all seemed to have fair wagering requirements as far as I could decipher. The casino at BetVictor on Android is awesome. The games are varied and the library is huge. Titles from both Net Entertainment, IGT, and Microgaming find their way into BetVictor’s mobile library here, and I stayed playing at the casino far longer than at any other Android casino than I can recall. Some of the great slots I found at BetVictor include the cascading Jack Hammer, Frankenstein, Elvis, Starburst, Tomb Raider, and Da Vinci Diamonds. I loved the sheer variety here, and have come to think of BetVictor as a “one stop shop” for all of the slots that I love to play. There simply isn’t any reason to move on from BetVictor as the casino offers almost any slot that you can imagine. Table games are also available, and while they don’t contain the large selection of titles that the slots do, they are a ton of fun and offer great fun for the punter. Table games offered include blackjack, and roulette. 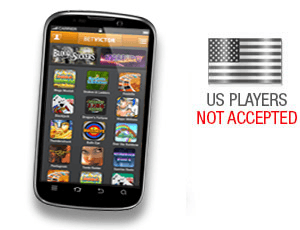 Limited video poker games are also available at BetVictor. While I am not a huge fan of the game, the Jacks or Better game is one of the better Android compatible games that I have played at a casino. 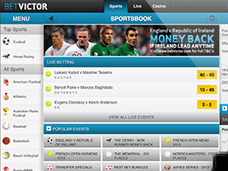 BetVictor’s sportsbook is one of the best that we have seen in the industry. The functionality of the system is very smooth, and we had no problems navigating the menus in order to find the match that we wanted to wager on. Putting together the betting slip was also very, very smooth. I had no issue with assembling parlay bets or straight wagers, and think that this is among the best systems that I have ever used on my HTC Butterfly. Live in-play bets are also accepted on BetVictor’s mobile site, which enhanced my viewing of the Chelsea match that I was viewing simultaneously on television. After having played for about a month, I decided that I had to withdraw some of my bankroll in order to complete this review. I had the option of using the following methods to finish my withdrawal: PayPal, Visa, Skrill, Solo, Laser, Bank Wire, Neteller, and Maestro and many more. I decided to do a PayPal withdrawal, and had to end up submitting some documents to the casino through my PC. This is the only section that I could not use my mobile phone for. After having my identity verified and processed, the withdrawal was processed within a few hours. This was an incredibly speedy process and I really can’t say enough positive things about the banking system here. BetVictor knows what they are doing, and you can completely trust that they are looking out for you. The customer service at BetVictor is also very good. I struck up a few conversations with the staff through my phone, and found the staff to be cheery and very helpful. The staff here is some of the fastest and most knowledgeable I have encountered, and probably the most in-sync. The customer service personnel were able to tell me what was going on in other departments, which is a rare feat for a casino’s staff. This is another area of BetVictor that I simply cannot complain about. It is just about perfect. 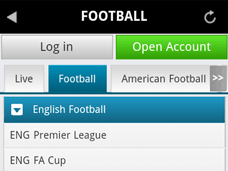 Overall, I feel that BetVictor is perhaps the best all around Android sportsbook out there. The varied game choices and intuitive sportsbook design are fantastic, and the bonuses, banking, and customer support are equally as impressive. If you live in a country that BetVictor services, you should definitely make it one of your Android betting sites. It is just about perfect.